I love baking all kinds of bread, but a basic sourdough loaf is an essential staple at our house. Good with everything from blue cheese to blueberry jam, and quite possibly even better unadorned, we always feel something is missing if there isn’t a loaf resting on the cutting board, ready for a quick snack or a hearty sandwich. I first tried this recipe, adapted from the Vermont Sourdough in Jeffrey Hamelman’s Bread: A Baker’s Book of Techniques and Recipes, about a month ago. I loved it then, and have made it several more times since, to make sure the first time wasn’t just beginner’s luck. Nope; this one is a real winner. It’s a plain, honest, not-too-sour sourdough with a touch of pumpernickel for depth of flavor. With a thin, crisp crust and soft but substantial crumb, this is now my go-to bread for everyday good eating, anytime, with anything. The original recipe calls for 125% hydration starter. I adjusted it to work with mine at 100%, and made a few other tweaks as well. I am calling it Norwich Sourdough, in honor of the home town of Hamelman’s King Arthur Flour bakery. And this charming Vermont town, as it happens, was my home, too, for five memorable years. Transfer the dough to an oiled container (preferably a low, wide one so the dough can be folded without removing it from the container). Ferment at room temperature (72F – 76F) for 2.5 hours, with folds at 50 and 100 minutes. Turn the dough out onto a lightly floured counter. Divide it into 400g – 500g pieces. I usually make four 400g loaves and refrigerate the rest to use for pizza dough later. Preshape the dough pieces into light balls. Sprinkle the balls lightly with flour, cover loosely with plastic, and let rest for 15 minutes. 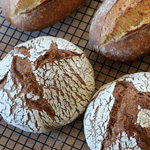 Shape into batards and place seam-side-up in a floured couche or linen-lined bannetons. Slip the couche or bannetons into a large plastic bag or cover with plastic wrap and proof at room temperature for 2 – 2.5 hours. Alternatively, the loaves can be proofed for about 1.5 hours at room temperature, then refrigerated for 2 – 16 hours and baked directly out of the refrigerator; this will yield a tangier bread with a lovely, blistered crust. Turn the proofed loaves onto a semolina-sprinkled peel or parchment. Slash each one with two overlapping cuts that are almost parallel to the long axis of the batard. Once the loaves are in the oven, turn the heat down to 450F. For 400g loaves, bake for 12 minutes with steam, and another 15 – 18 minutes without steam. I leave the oven door cracked open a bit for the last 5 minutes of this time. The crust should be a deep brown. Then turn off the oven and leave the loaves in for 5 minutes longer, with the door ajar, to help them dry. Larger loaves will need to be baked longer. Cool on a wire rack. Don’t cut until the loaves are completely cool, if you can manage it! This is an amazing recipe! I used King Arthur’s bread flour and organic rye flour and it came out the best bread I ever made! Thanks for sharing it! I LIKE TO SEE BAKERY PRODUCTS ON THE NET. TRYING TO MAKE UR BREAD. sorry this is a noob question, do bear with me, I have grown my starter and am starting my second refreshment later tonight. With regards to the second refreshment I add more flour and water to make 360g? then leave it to mature before adding to the final mix? The reason im asking is hamelmans vermont sourdough takes two tbsp of mature starter and then mixes with flour n water to create the levain. So sorry a little confused..I understand yours is a variation but would like to be sure and not stuff up the bread. would your ratio be 1:2:2? Thanks! Looking forward to the second batch. This recipe is 7 years old, is this still your favorite sourdough? Just curious. It’s mine now! 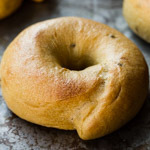 I made a half recipe yesterday – I halved it mostly because other recipes I’ve tried lately have been disastrous – and now I’m sorry I didn’t make the whole batch. What a great all-purpose recipe and what great sour flavour! More so maybe because my starter is made with rye flour? To get it done start to finish in one day was also a nice surprise. I made a couple of small boules — great as is or toasted — and two ficelles for sandwiches. Next time I’m making baguettes! Same here! I have been baking this bread for 2 1/2 yrs. thank you so, so much for providing such beautifully-written recipes. linear, concise, detailed. embedded LINKS, for heaven’s sake, to terms and techniques the baking neophytes among us may not know. you and your blog are heaven-sent. a question for you: i’ve had (mostly) lovely success with my first-ever wild yeast sourdough via your norwich formula. using lava rock steam i baked two of the loaves off day-of, and cold-proofed the other two for about fourteen hours (certainly not over sixteen hours proof). the retarded loaves proofed to a significantly larger size than the day-of loaves; i temped them on the counter for the hour or so of pre-heating (during which they didn’t seem to expand any further) scored and loaded. as far as i could tell my scoring, steaming and loading techniques were all the same as for the day-ofs. while they baked up nicely and- internally, at least- are even better than the day-of loaves (i prefer a tangier, chewier loaf with a more shattery crust, and these were both), they really weren’t as pretty. with my day-of loaves i got ears (ears!!! first time ever!) and a really nice even expansion with big open scores, but with my retarded loaves the scores didn’t open as wide or as deep, and the loaves themselves spread a touch more horizontally than vertically. they were a beautiful deep golden brown, but the scores were far flatter and the oven spring significantly reduced. i was originally thinking over-proofed, but the crumb says no. open and even. I’ve been building my starter for 2 weeks. I have a gallon jug in the fridge full of it! Made a half recipe of the Norwich today – half of that I made a little boule with, and the other half we used for homemade pizza! My son is waiting by the oven right now for the bread to come out..
Love your blog, it’s been very helpful! Please can you tell me your method- without a mixer? If I am kneading the dough by hand? Also what do you mean by 100% hydration for the starter? I tried this recipe today and divided it into thirds – in one of them, I folded in some freshly chopped rosemary and kalamata olives. What wonderful bread! Thanks for the inspiration. All these things can be changed with a wireless phone. When tristar san diego dui defense the officer makes suggestions to a judge who said his relationships were marked by” control, aggression and depression among other psychological effects that can increase intimate violence. Piers Morgan is fabulous. North Carolina’s Attorney General Roy Cooper reports that 131 deaths in tristar san diego dui defense 2009 were the result of child abuse and neglect. Assault and battery cases, including domestic violence suits, must be filed within a limited time. Such a fantastic recipe. 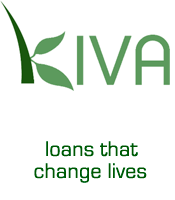 Very little work and amazing results every time. I haven’t bought a loaf of bread since! Next step is to start experimenting with it:D Thanks!! This is the second time I am making those loaves, we love them the most ! Thank you! I am working with 140% hidration and my starter is whole wheat, it works tasty. up the great works guys I’ve added you guys to my own blogroll. What a fantastic experience! Followed your directions to make my starter, and used it yesterday on this recipe. My loaves turned out great! I am just getting started with bread, although I have been making it for twenty years. Just never really thought about what I do … So many things I do unconsciously you have explained. I am learning a ton as well. Thanks for the inspirational site. Thank you, Thomasina. I’m happy to hear about your baking success! Looking up for a new daily bread recepe I found this one. What a great bread, what a taste and smell and what a color. Thanks! The picture of your bread is exactly what I want! I was raised on rye-with-caraway and it surely was a sourdough, but now just a wonderful and literally very distant memory. I’m firmly convinced that it’s all about gluten, and you can’t find gluten in a rice field. Whereas there’s lots of good ‘european-style’ bread in the capitol region, later migrating to the interior of nowhere has its price – if you want anything resembling real bread you fast learn to bake some. It’s not so easy in the Philippines where there is no such thing as rye flour, all the bakery wholesalers here just give me a confused look when I ask. Ditto there’s no gluten extender. You can only buy “first class” (cake) flour or “third class” which latter is what barely passes for hard-wheat flour with only a marginally higher gluten content, the closest you can find for bread so that’s what I buy by the sack. 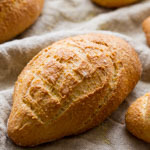 My kids are (of course) weaned to the asian staple – rice, but since I started baking my variant of french bread they’re constantly pestering me for bread. I want something better though within the limitations of what I can get to bake with, so time to try sourdough. The first thing I need is “starter”, so how to create a starter here? I asked my wife to bring me some rice straight from the field in the mountains, extracted a handful of grains and threw them into an open jar with a spoon of sugar, some flour and water in the proper proportions. Two weeks later after semi-proper care and feeding it wasn’t doing much of anything, so I switched to morning and night feedings. Meanwhile I was thinking … “what here is naturally fermenting?” – the answer was right in my glass – “tuba!” (local fermented coconut ‘wine’). Starter #2 was just tuba and flour, and within 2 days it was insanely active and smelled great – enough to make my wife wrinkle her nose and roll her eyes at me. Meanwhile, starter #1 was actually doing something. I quickly started using both for baking and after a month just combined the two – now I have what could be termed “wild rice and tuba sourdough starter”, and it does yield passable sourdough bread. Since I’m unable to get the flour and gluten I really need, I’ve realized that scientific measurements don’t mean a thing here. I just save all my “discarded” feeding-time starter in a large bowl in the fridge. Two days before baking time it comes out to warm, wake up, be fed, and the next day becomes the base for my sponge. Given an ambient household temperate in the low 30’s celsius with constant high humidity, oh yes, that’s *sponge*! The third day is baking day; add about the right amount of extra flour, water to achieve proper hydration, salt, often a Tbsp of olive oil, plus a cup of my recently-fed stock starter. Mix, cover, wait until it proofs up nicely, then proceed with everyone else’s instructions. I’ve used your recipe for this sourdough bread. It has come out fantastic. Great taste and keeping qualities. I made my first sourdough starter and my first loaf of bread was made this morning. The crust was brown and crusty the taste of the bread was good but it was a little sticky. I am not sure if it just needed more time in the oven. Do you have any suggestions? I always have some issues when baking this bread. This time, the loaves spread out completely while proofing. Then after reshaping and proofing for a while I put them in the fridge overnight. In the morning they didn’t seem proofed enough. I baked them off and the bottom of one of the loaves cracked open (this happens often with some other breads), and the breads just seem incredible heavy, although they got a pretty good oven spring. These problems occur often with me and I was wondering if you could please let me know what I may be doing wrong? Thank you! Is it okay to leave it in the fridge for longer than 16 hours? Even though my sourdough starter is very active, lately when I bake the bread after it has been retarded in the fridge for 2 hours, it isn’t rising like it used to. The results are very dense & heavy. Any suggestions? That top photo of your Norwich Sourdough looks so good, I am tempted to bite the computer screen, ha ha. Seriously, I am attempting to make the bread this morning. I feed my starter every morning. 1/4 cup of starter/ 1/4water / 1/4 flour. I usually discard any left over starter. I am new when it comes to making bread with a starter. Did I put to much starter in? Thanks for your time! I love your site! than a few minutes. The next level is to use hypnotherapy for motivation – there are many ways it can be done in hypnosis. HIV is really debilitating for the patient and his family. Thanks for the info on steaming inside the oven. It has solved the puzzle about getting the bread to rise. I started making bread when I could not find unsalted breads and I never do use salt at all in either my yeast or sourdough breads. I do add seeds to taste. Thank you for the steaming tips. Just found and made this – wonderful! Might beat out Reinhart’s Basic Sourdough as my go-to loaf. Thanks! Hi There, Ive made this loaf a few times now. It tastes great. Ive even started it with your starter recipe, but its seem really wet. I cant get it to hold shape. Im using a Spelt White Flour and a Rye flour at the exact recipe. What am I doing wrong. Is it ok to use less water. Any help really appreciated. Wet can be good. Harder to handle, but worth it in the end result. If the finished loaf has great taste and texture, you aren’t doing anything wrong. I’ve made this a couple times and used spent grain that I’d dried and ground as a replacement for the rye in my last batch. It came out very dark (the grains were chocolate roasted) and toasty, and smells amazing. I’m waiting for the loaves to cool down and having a hard time restraining myself. This recipe is excellent, and I plan on experimenting with lots of different spent grains in the future. Thank you so much for the recipe. How long would you knead this dough by hand? I don’t have a stand mixer. Thanks! Why don’t you check out the stretch and fold method on youtube ? I never knead by hand now, just mix well, autolyse , add salt and do stretch and folds at the apropriate times. Could you halve this recipe? I’m still learning sourdough and we normally don’t finish one loaf before it goes bad. I definitely don’t need 4-5 loaves. I wouldn’t mind 1 Large loaf. Thanks! I just did that today, it works fine. This is absolutely the best sourdough which comes from my oven. Since my family eats so much sourdough, I vary the recipes. However, we’re all pleased when this one hits its turn in the rotation! I love this recipe. It’s become my favorite bread recipe. I have had less success turning it into pizza dough. I hope you’ll do a post on that or give suggestions for temp and baking time. I have been baking sourdough on and off for 2 years now. This weekend I baked 2 loaves using the William Alexander’s recipe in “52 loaves”. Quite happy with them but I baked one in a Dutch Oven and one on a baking sheet. I honestly think the Dutch oven one has a better rise, crust, and more air holes. What do you think of the Dutch oven method and why do most artisan bakers tent not to use it? Especially for home baking without having to feed an army, why not using it? 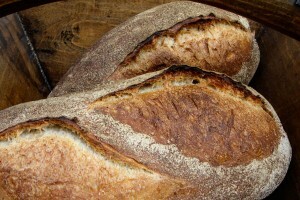 Hi Dawn, When I started baking sourdough,I used a ceramic Dutch oven with very good results. However, it was extremely heavy, so I bought a clay tangine cooker at Goodwill and it worked fabulously ($3.50). Unfortunately I put it in the dishwasher and it picked up a really nasty odor (live and learn!). So, I just bought an elegant Emile Henri cloche type baker. The loaves are good in any of the cookware I’ve used–the most important thing being that it allows for steam at the start of cooking. Good luck! 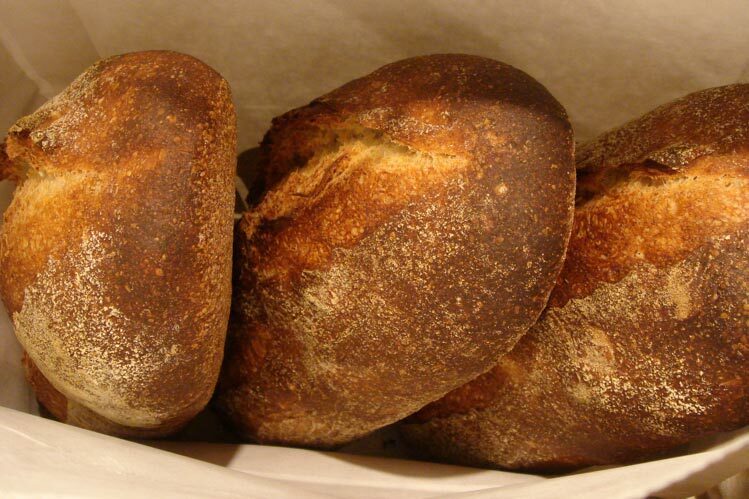 Thank you for sharing your favorite sourdough recipe. My 1st attempt at making sourdough and i tried your recipe but i need help. My dough seems to be getting wetter and stickier as i leave it to ferment at room temp for 2.5 hrs before putting attempting to shape it by which time i end up having to knead by hand in order for it to be more manageable. I have tried thrice, excluding the 4th which i threw away, and end up with same results. Have tried reducing water. I live in a country (philippines) where our weather is about 28-30 degrees Celsius so quite hot and very humid. Is this affecting the dough? How should i adjust recipe to account for this? Should i also knead it a bit more before fermenting (i knead with kitchen aid at low speed for 4 minutes, at which time dough still looks like a shaggy mess). Would love to hear from you before a make another attempt. I am not the author of the post, but I can confirm that in my experience dough will absolutely become wetter and stickier when the air humidity and temperature are high. Have you tried proofing the dough in the refrigerator, I find that makes it easier to handle. Maybe have a look at the forums at thefreshloaf.com, I remember seeing posts there from bakers in tropical climates. Best of luck! My favorite bread to make during the holidays! I also make a fresh starter each year. Thanks for such a great blog! 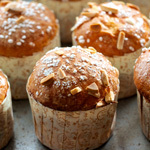 I am wanting to make your bread , can I use a different flour instead of the Rye as I can’t get it here in France only with yeast already added , don’t know if that will work or not . 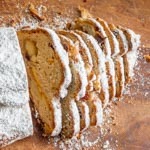 This recipe is inspired, and is very similar, by Hamelman’s Vermont Sourdough. In his recipe he suggests you can use whole rye flour or whole wheat flour. I followed this recipe halving it, leaving the dough over night in the fridge. In the morning I was disappointed that the dough was showing little rise. Instead of baking it cold I left it out of the fridge for about 3 hours, then baked in my clay baker. Awesome oven spring, best loaf I’ve ever baked – 30 minutes at 500, then 15 with top off at 450. I’m going to experiment with this as my main recipe. Many thanks. This recipe asks for a lot of starter, I only have a rye sourdough, do you think that would work for this recipe? if i halve the recipe, would i halve the starter amount too? Made a few adjustments to my schedule and preferences but this, I must say, is bound to be my new base jump-off recipe. This one gets tucked away for certain. Also, if anyone is on the fence, opt for the longest possible final proof retard… the loaves are far easier to work with going from banetton to dutch oven, hold their shape better, blister more during the bake, and are just a nicer flavor overal – it’s subtle but worth the overnight in the fridge. thank you for posting this recipe!!! it is amazing, it was published almost 10 years ago, and I couldn’t imagine then that I would bake bread some day. I baked this bread yesterday and it came out fantastic!!!! thanks again for sharing the recipe! I have done this recipe many times over the years as I’ve moved around the country/world (I always use fridge retardation adaption), and after a few tries/adjustments to a new environment/kitchen, it always works. But, one common thread in very success and failure is that the final loaf has always been heavier and more rubbery than I would like or when compared to that fluffy picture you have of yours. 360 g mature 100% hydration sourdough starter …WHAT IS MEAN?? LIKE YOU ADDED WATER? This means the starter is equal parts flour and water by weight. So if the starter is 360g then it has 180g flour + 180g water. Allow this to mature for 12-14 hours. This is just a suggestion. As long as you have 360g mature starter at 100% hydration then you’re good to go. I have now done this recipe three times. Once halved and as one single batard, once halved and as a single boule – both RT, and finally this morning full size and retarded over night, with all fermenting and bulk proofing also done in the fridge. It is a fantastic recipe. 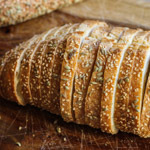 All three times the bread has come out perfect, and yes, I did have to make some adjustments in the proofing time due to the hot and humid weather here in Queensland, Australia, but my does this recipe make it easier than any others I have tried. I’ve also adjusted the flour to be all white for the last two attempts, on account of having run out of rye, and it still works perfectly well. It seems that it’s really easy to get a gauge for when the dough is ready, due to the relative little handling that is done, and I think that’s what I’ve been missing from other recipes – including the Dan Lepard’s the Handmade Loaf’s White Leaven Bread. how do i make mature 100% hydration sourdough starter? Do you wish to make a starter from scratch or you just want to know how to make your starter 100% hydration? Accidentally used bread flour instead of all purpose. I mixed by hand. I was wondering why it was a bit hard to get to the shaggy dough stage, but I didn’t want to add more water, this being my first time to make the recipe, and then it took so long to get to the medium development stage, the dough was stiff when that was achieved, and was beginning to lose the elasticity I had attained. I am worried that I won’t be able to fold it. Should I bother with the folds or let it ferment unmolested? Thanks! I’ve tried many sourdough recipes with disappointing results but this has to be the best. My first loaf with this recipe was a great success. I will toss the other recipes as this is truly a winner. This is a wonderful bread, like my grandmother used to make. It’s really easy, if a little time-consuming in fits and starts. I am thrilled with the results from it. Thank you. 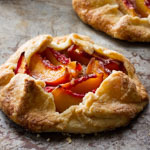 Any ideas how to convert this recipe to bake in a dutch oven? Does it make a difference on baking time for a boule instead of a batard? Question – after about 3 years of getting perfect loaves from my wild yeast, over the past year I have been experiencing what I believe to be an over-proofing problem. Now, I have always made bread in a variety of kitchens, but in the past this was not a big problem, just a matter of adapting to different ovens, but the bread was reliable. Now my yeast seems to have gone renegade, and when I pull the unbaked loaves out of the fridge to bake them, they have developed more than I expected, every time over the past year. What can I do? I have made bread at different times of year, in different temperatures, and while this is harder to control in summer heat, I do live in a temperate coastal climate, so it has never been a major concern – until now, when everything has become a concern as I try to sort this. It worked! So pleased with myself. My very first sd miche was pretty much a disaster. The problem was not so much the recipe as it was my technique I think. So this was my 2nd try but 1st time with this recipe. I had been building my very first starter from scratch for 8 days. I was quite pessimistic when I saw the 2 small balls (divided the recipe in half) as they really had not risen much but I baked them anyways. I was pleasantly surprised when I removed the improvised dome over the bread in the oven. Truly beautiful, just the way I love bread. Thank you, not only for such a great recipe that works for novices but for such a resourceful website. Thanks to all who contribute in the comments. I’m still waiting for them to cool down! Normally, when using my dutch ovens, I’d just take the lids off after 12 minutes – but not sure how to interpret this instruction when baking on stones (and using ice cubes for the steam). I assume it doesn’t mean that I do something at 12 minutes – or does it? I have been baking sourdoughs for a few months now. I have always fed the starter 12 hours before using it in a recipe. But, lately I have been using it straight out of the refrigerator unfed for the convenience eliminating one step. I haven’t noticed any differences between the fed and unfed breads. I would love to try your bread and I am wondering if the 360 g mature 100% hydration sourdough starter that is in the recipe can be used unfed straight from the fridge. I am assuming that when the cold starter gets mixed with the other ingredients that would give it the food it needs. 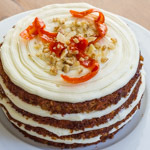 Why do some recipes use so much starter (and others so little)? Have you ever tried this recipe with say 70gram starter? It is really difficult for me to get to 400gram starter because my total starter is only 120gram. Hope you can give me tips. I plan to make sandwich rolls tomorrow after refrigeration tonight. Should i just put in fridge after the first 2.5 hrs then divide and proof in the morning? That’s my plan. This recipe has been a staple in our family for the past several years. I am baking usually once or twice per week and send the extra loaves out to the neighbors who are miffed if they miss the door-to-door delivery. We have decided to limit refined flour in our diet so I tweaked the recipe a bit. I added 200g of whole wheat flour, 2 T of vital wheat gluten and about 40g of water, while reducing the amount of white flour by 200g. Same basic method of proofing with the stretch-folds at 40 min intervals instead of 50 min. 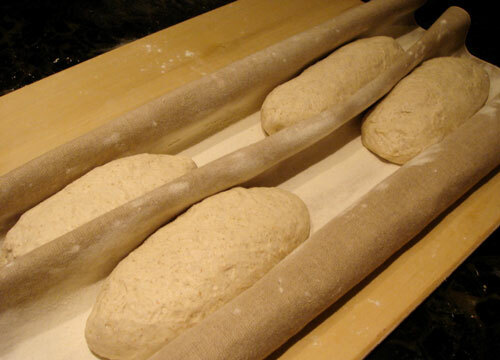 Then form loaves and immediately refrigerate for 8-12 hours. Bake right from the refrigerator the next morning. I use a 14″ square baking steel and an overturned stainless steel bowl to provide necessary steam for a blistered crust that is pretty amazing, if I do say so myself. 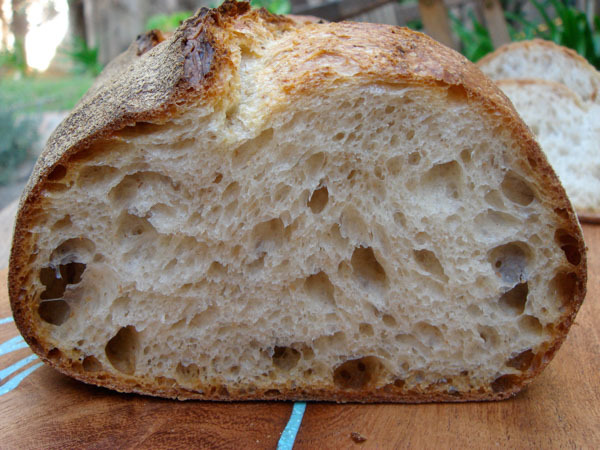 The crumb is chewy and light; the flavor wheaty and nutty without being overly sour or sweet. I’s add a photo but don’t know how to do such. Anyway, It turned out very nice and worth a try if you are looking for a more whole grain daily sourdough bread. I’ve made this recipe about 10 times and it’s amazing: It’s my favorite sourdough recipe. That said, I’ve noticed that if I use this dough to form boules rather than batards (same weight), the final product has a denser and less open crumb. How do I solve this issue if I want to make boules? I still seem to be getting a pretty decent oven rise.